Micheli Silva Cardoso do Lago, known professionally as Mikeli Hub, is a Brazilian multi-instrumentalist, singer, composer, musical producer, visual artist, actor, dancer, writer and poet. His literary production is vast: more than a thousand creations, between novels, chronicles, plays and, mainly, poems. He became known on the internet from 2008, when he released his authorial album Longe de Casa (Far from Home), which earned him more than 100.000 plays on Myspace. He is admired for writing songs in several languages, create and record your own music arrangement, besides his baritone voice and creative videos. 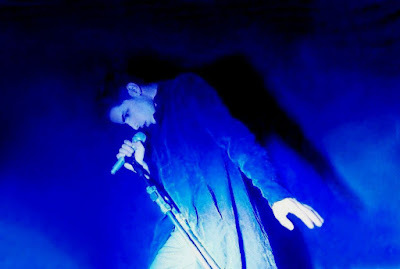 Belonging to the same generation of artists like Mallu Magalhães, Strike, Vanguart and Roberta Sá, but less known from the mainstream media, Mikeli Hub consolidated in the alternative virtual music scene of that time and he remains active to this day. In social networks like Myspace, mainly, it was common that the artists exchanged information and encouraged each other. Mallu Magalhães, who in that year appeared to the general public, even sent messages of encouragement to Mikeli. "At Myspace, we were all friends. But the conversation was short. Everyone had other activities, like college and work... And the little time left was occupied by the generally rudimentary recordings we did. There were so many new people arriving with a lot of good music and improvised clips, that we all often left messages in the profiles of those closest partners, encouraging them to continue... While many people were on Orkut and Facebook, we were living on MySpace and watching MTV"... In 2008, when MTV Brasil announced the name of Mallu for the Artist of the Year award, although she did not win, we that knew her through the web and shared the same dreams, we vibrate together", confesses the artist. Success would happen for many of them and it happened. Many have become famous and others continue to inhabit these alternative places (real and virtual) away from the spotlight. Even so, as history has proven, a lot of good music continues to echo in these spaces. Like many children, Hub sang in the choir of the church and performed in various theater plays at the school. The difference is that the boy already knew what he wanted to be... In fact, he always was! He just did not imagine that, besides the theater, music would also become fundamental in his life. In 1998, on the threshold of adolescence, Hub joined the Trancos & Barrancos Theater Group. In the same year, he began to study piano, harmonica, guitar and everything else that came to mind. The following year, he was invited to join a musical band of Brazilian rhythms, although he did not even imagine that this experience would become frequent in his life. The theater plays took place in parallel and always received more attention and dedication from the young Mikeli. Until then, music was just a hobby. The plastic arts, the fascination with multiple languages ​​and all sorts of mystical and literary subjects devoured all his time ... And he loved being immersed in this ocean of information. In 2001, on an improbable summer night, behold at his doorstep beats a first composition: 'Princípio' (Beginning) - this song literally marks the begin of his career as a composer. As time passed, Mikeli found himself increasingly in love with theater, poetry, music... And all this rhymed with the rebellion he still holds. But fate had plans that even he did not anticipate. For varied reasons and coincidences that only time would explain, theater gave way to music, which became more and more central in his life. But personally, Mikeli does not separate his vocations into categories: "everything is art everywhere... And the musician also acts when he sings, plays, writes and dances... Maybe, I'm just an actor giving life to the musician who appeared in me", he explains. Anyway, Mikeli Hub is there to be what he wants and, above all, to fulfill his duty to live the art that he is. Even far from the old theatrical spectacles, Mikeli continued in contact with his original art. In 2006, he studied at Liceu de Artes e Ofícios da Bahia, home of great actors, in Salvador, Bahia. A few years later, he entered the Theater and Dance degrees at the Universidade Estadual do Sudoeste da Bahia, but he did not finish them. Currently, he studies a degree in Literature at the same university. Since 1999, Mikeli has participated in many bands of the most varied genres, performing in countless cities in Bahia and other states of Brazil. But the true is that he selected the Rock n' Roll universe to shows all his eccentricity. However, surprising the more conservative, Mikeli has recorded many genres: from classic to modic... And he considers himself "the creator of Bossa Rock" - a genre originated from the fusion between Bossa Nova and Rock n 'Roll, present in his song Volta da Revolta. Fan of famous bands such as U2 (a real obsession), A-Ha and Radiohead, as well as other lesser-known ones, but as fabulous as these... Timeless artists from Brazil... Mikeli always has some preciousness in his sleeve and likes to surprise the audience singing their idols' classics. But until today, in all his albums, the audience finds only his authorial songs. All of these songs reveal a little of their artistic essence, translated in the form of melody and lyrics. In the best do-it-yourself style, Mikeli Hub continues to create, develop and advertise his own sound. Since 2012, his songs are distributed all over the planet by the American label ONErpm. In order to deal with so many ideas and plans, your energy source must be inexhaustible... And it's! VOLTA DA REVOLTA (Revolution Returns) – second autobiographical album of Mikeli Hub – was released in mid-2012, while he was living a quite expressive personal transformation and intense reworking of concepts. All the songs on the album are compositions by the artist that dedicated it to his great love. Initially, Mikeli wrote the song that gives title to the album, inspired by the protests that marked the Arab Spring in the Middle West in 2011. Mikeli was impressed with the return of the popular revolt against old oppressive regimes and various social problems. Face with such an effervescent scene, his musical verve was awakened, but soon gave way to the natural romanticism of the lovers. According to him, the album should talk about those revolutions, but rebelled against his own creator and spoke of the greatest of all revolutions: LOVE! 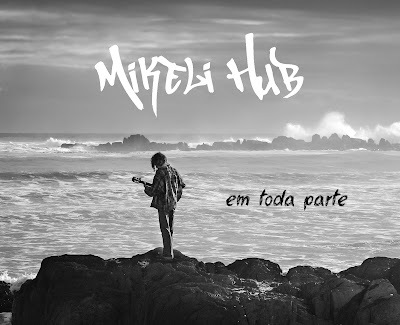 EM TODA PARTE (Everywhere) is the name of Mikeli Hub's fourth album. Released in 2018, this album celebrates the 10th anniversary of Mikeli's first album: Longe de Casa (Far From Home). So, in addition to singing hits from that album, Mikeli presents some new songs, like 'Milagre' (Miracle). Mikeli considers this album "special and precise". Once again, he produced everything in the "do-it-yourself" style, from design to finish. With simple features but a lot of creativity and stubbornnerss, Hub incorporates an ideal of artistic creation based on the commitment to offer something original to the public, independent of the current Brazilian music market. Independence is my art, Hub says. The most sensitive listener will be delighted by this album right away. Track 1 is like a sword tearing the soul, says the artist... And the other songs are full of purity and have a very remarkable authenticity. Because it is an 'almost acoustic' album - although this concept has been reformulating in the latin phonographic market - Mikeli Hub gives voice to the piano: an instrument of greater prominence in the disc, next to the low-baritone voice of the artist. As an audacious multi-instrumentalist, Mikeli is ahead of all the musical instruments heard in this album, as in others, which is not common in the universe of music. Therefore, we can say that 'Em Toda Parte' is another sample of the many talents of this Brazilian fascinated by keys, strings and words... It is a record for those who seek new sonorities in the alternative scenario of contemporary Brazilian music. As the lyrics are Mikeli's compositions, the truth permeates each phrase echoed and gives weight to the content of his latest album, notably dense and pictorial.